The SpaceX spacecraft was captured at about 6:56 a.m. EDT (1122 GMT) by Japanese astronaut Akihiko Hoshide as the space station soared 250 miles (402 kilometers) above the Pacific Ocean, just west of Baja California. The capsule was attached to an Earth-facing docking port on the station at 9:03 a.m. EDT (1303 GMT). "This is a big moment in the course of this mission and for commercial spaceflight," said SpaceX CEO Elon Musk, the billionaire entrepreneur who founded the company in 2002. 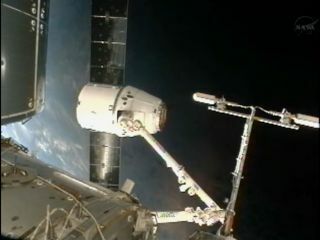 "We are pleased that Dragon is now ready to deliver its cargo to the International Space Station."